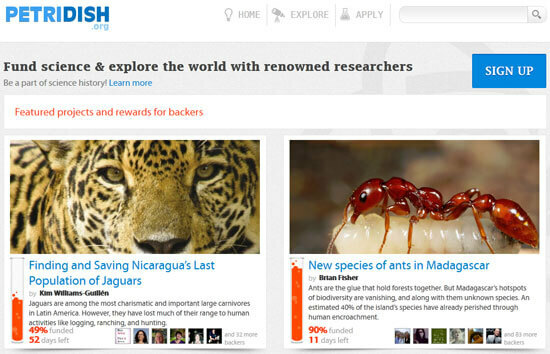 Petridish aims to help important scientific research get funding by crowdsourcing it. Science in the U.S. is slated for a devastating blow on January 2, 2013 when the debt deal Congress passed last year kicks in, implementing a 9% cut in science funding lasting until 2021. While university infrastructures will be hit hard, the cuts will put a chokehold on research funding, reducing grants and increasing competition for them. Yet, there’s hope. An alternative to federal funding recently launched named Petridish.org, a Kickstarter-esque startup that democratizes science funding by crowdsourcing it, providing a platform for researchers to pitch their science proposals directly to the public and allowing users to make scientific history by backing them. But is the public ready to engage science research so directly? I had a chance to chat with Matt Salzberg, Founder and CEO of Petridish, to find out. Petridish launched at the beginning of March with nine projects that span the range of the sciences, some led by researchers from elite universities like Harvard and Stanford. Each project offers rewards to backers based on their contribution, often focused on removing the veil to the scientific process by researchers sending frequent updates about the findings. Other rewards include having a species of ant named after you, a framed algae pressing from research on algal spores, CDs and DVDs of some of the data acquired, and private tours and lectures. But the real prize is acknowledgment in scientific publications resulting from the research. The success of crowdsourcing on Kickstarter provided inspiration to Matt to found Petridish, yet it differs from it in a few important ways. First, unlike many Kickstarter projects which often produce something tangible like a gadget or video game, the endgame of each Petridish project is knowledge, so it caters more to the science lovers and philanthropists of the public than to consumers. Second, Petridish is much more heavily focused on community, and that means two-way communication between backers and researchers as well as a transparency in the scientific research. Finally, because of the impending Congressional budget cuts, the economic and political climates, and the rapid pace of technological change, Petridish is positioning itself as a viable funding alternative to the federal government in an incredibly high-stakes game, whereas Kickstarter projects tend to be fighting for a space in the marketplace and contending with trends in specific industries. 2012 is shaping up to be a pivotal year in science with paradigm-shifting efforts that would make Thomas Kuhn, author of The Structure of Scientific Revolutions, proud. The Elsevier boycott continues to grow stronger every day as researchers push for more open access to journals, which would allow even greater numbers of people to see the results of taxpayer-funded research for themselves. Science Exchange, which was recently covered on Singularity Hub, is providing a way for scientists to outsource experiments and provide services to scientists around the world, creating a community-driven marketplace for research and a renovation of science funding. Longstanding calls from the Open Science Foundation to make the process of science more accessible to the public is gaining much needed attention from the media. And in response to the Congressional budget cuts, an MIT-based protest called Stand With Science has acquired over 10,000 signatures calling upon Congress to ensure that science continues to be funded. Collectively, the themes of all of these efforts are openness and funding, and it’s why Petridish enters the scene at a crucial time offering public access and financial support. Still, it’s hard not to think of Petridish as “The Kickstarter of Science”, though that’s not necessarily a bad thing. One can only hope that the same level of success seen in Kickstarter projects for gadgets, video games, and comic books, could be seen with scientific projects investigating the search for exomoons, estrogen contamination in local water sources, or a new species of ant in Madagascar. Many factors must fall in place for Petridish to be a success. The funding targets need to be realistic, which means that the focus of the projects need to be well crafted to ensure their viability. Researchers need to convey their ideas in an engaging, accessible tone. And of course the rewards must be desirable. On top of all of this, Petridish isn’t alone with the recent beta launch of Microryza, which has the same aim of funding science research through crowdsourcing. But the true lynchpin of success will be the public. Do people really care enough to want to give money to support specific research projects? Can science ideas be as exciting to the everyday person as they are to the researchers? Is the emotional payoff of backing a research project enough to want to give again? The answers to these questions will come in time, but if the public perceives Petridish as being more akin to a charity catalog than innovative crowdsourcing, public support will likely be disappointing, and another great web idea will fade. Petridish takes a huge risk turning to the public for financial support, but the alternative is to do what scientists have been doing for years: vying for money from the government and corporations in an increasingly competitive environment. 1. There’s a lot of mixed opinions about research funding in the public’s eye, so why choose science as an arena for crowd-sourced fundraising? Science is an area that is oftentimes dramatically underfunded. There are many kinds of projects that can’t be funded today for a variety of reasons. Certain fields are out of favor for one reason or the other, and the government has limited amount of funding and specific goals in mind as to where it should go. There’s only a limited amount of money to go around. 2. It may be hard not to think of Petridish as “The Kickstarter of Science,” but in what ways is Petridish a more appropriate site for scientists than say Kickstarter’s technology division? People who go to Petridish are looking to get involved with and fund science research projects. In many cases, Kickstarter wouldn’t feature a lot of different kinds of science research because it doesn’t fulfill their criteria where there’s some sort of discrete product being produced. We’re more about basic research and discovery, and the output is knowledge. To get the great and interesting research projects on a site, you have to make scientists feel comfortable professionally. A lot of the scientists and researchers that we’ve spoken with wouldn’t feel comfortable featuring their professional application and their research on a website that’s very tongue-and-cheek. 3. How much interest has Petridish garnered from academics? We’ve had hundreds of researchers interested. We’re trying to make sure that that the projects we do feature have a good chance of getting funded. We’ve been holding back launching more projects than we can, so we have a backlog of projects. 4. What is the appeal of Petridish over traditional research funding models? First, you can share and engage the public around your research. Even researchers who don’t need funding are interested in posting on our site because they want a way to share their ideas and engage the public. Second, our funding is much more researcher friendly. We structure it as a gift and not a grant, so we cut out a lot of the bureaucracy in government or other funding sources. On top of that, it’s a lot easier and faster to apply for what we’re doing. We want to shorten the cycle from when a scientist has a good idea to doing the research, which will accelerate the pace of innovation. Fourth, there’s funding available from the public for many areas that the public is interested in, but, for one reason or the other, the government is not. 5. Scientists aren’t always trained in video presentations or making a sales pitch. Does Petridish offer any kinds of tutorials or services to help those who have a great idea but are intimidated about venturing beyond their skill set? We’ve been very helpful to the first group of scientists that have come on. We have been giving them tips on how to improve their videos, how to improve the rewards they offer, and how they can promote the project. Most of the people who’ve been coming to us are incredible communicators. Increasingly, you’ll see more and more scientists who are social media savvy being quite good at this. We’re also working on developing more resources for scientists over time. 6. Generally speaking, some of the smallest grants come in around $25,000, so the limit on projects to be under $15,000 seems low. What advantages are there to proposing projects that require this minimal funding? These are a lot of early stage projects, but the government likes to go with established, safe existing lines of research. If someone’s trying to start a new project or has a new idea, it’s much more difficult to get that new idea off the ground and establish some sort of preliminary results or data. So the small grants allow you to get the bigger grants later by establishing early results and showing proof of concept. And you can do quite a bit with small grants. We have all sorts of researchers working with us, tenured professors, grad students, post docs, and young professors. Certainly, for younger people, that small amount of money goes a very long way. Even for more established scientists, there’s always additional lines of research that they might have or want to pursue that they just currently don’t have the funding for. We like to think that what we’re doing is researcher friendly and flexible. It fills a gap for the researcher to do the kinds of things they want to do that they can’t otherwise do. 7. In traditional research, some projects receive criticism for lacking broad applicability or for spending resources investigating minor problems when issues like cancer desperately need funding. What criteria are used to evaluate proposed projects for their viability as crowd-sourced funded research? We evaluate the researcher and the institutions that they are affiliated with to make sure that they’re reputable. We pick projects that we think are going to be interesting and accessible to the public, so that the public can make good decisions as to whether they want to be involved. And we weed out things that are obvious junk science like perpetual motion machines or paranormal activity. We’re fundamentally trying to change the funding model and allow people to back the projects that they want to see happen. 8. What kind of recommendations do you provide project creators about the rewards they offer? We want them to be unique and relevant to the project at hand so that backers of the project feel like they are connecting more deeply with the research being done. Most of the research projects on the site have the opportunity to get acknowledged in scientific journals at some level of contribution. You’re basically a part of the record and a part of scientific history. 9. How can Petridish serve as a platform to educate the public about science? First off, you can find interesting research projects going on in real time on the website, interesting things that scientists are looking to do and hearing it directly from the scientists’ mouths. If you back a project, you actually get insider updates on that research over time where the scientists let you know how things are progressing and be active in how research happens and how it works. So, there’s a huge educational component to it, not to mention that the fact that eventually you get access to the findings and the results. 10. How much do you anticipate projects with much stronger public appeal getting funded, such as endangered species or searching for life in the universe? Certainly, the broad appeal of the research is relevant. The efforts of the researchers are very important in terms of their ability to spread the word about their own projects. The size of the funding requirements are also an important determinant. So I think there will be a broad base of small successful projects and a smaller number of mega hits which will really resonate with people and get funded to quite high degrees. I hope that we’ll be able to get all sorts of projects funded.